Once upon a time we lived in Kansas City where we had a greenhouse in the backyard and a nice sized terrace where we had potted citrus trees. When we moved we couldn't bear to leave our beloved trees behind. 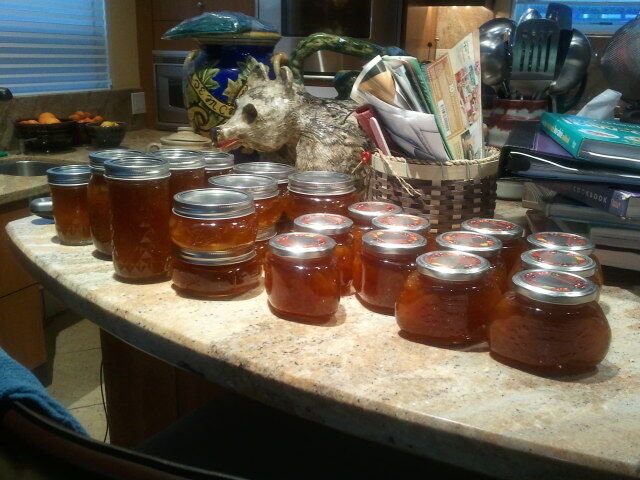 I have made marmalade from our Calamondin Orange Trees each year for decades. When we moved to a higher altitude the trees bore even more fruit...not what you would expect but they love it here. This year I harvested 2 huge bowls of little oranges and made over 40 jars of marmalade. My recipe is very simple. Harvest the oranges. Wash them. Halve them and extract the seeds. Measure the oranges and add 3/4 cup water to every cup of oranges. Put it all in a large pot. 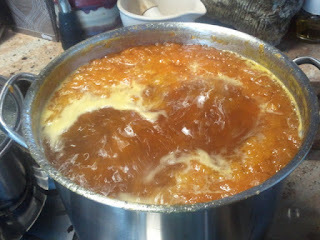 Bring it to a boil and continue boiling until the mixture is reduced by almost a half (takes about 1/2 hour) to bring out the pectin. Leave it on the stove to cool. Then put the pot in the refrigerator overnight to allow the pectin to continue to release from the orange peel. The next day measure the orange melange. Again, for every one cup of the mixture, add 3/4 refined sugar to the pot. Bring it all to a boil and then reduce the heat to a simmer for about 1 ½ hours, or until your candy thermometer reaches 220 degrees. 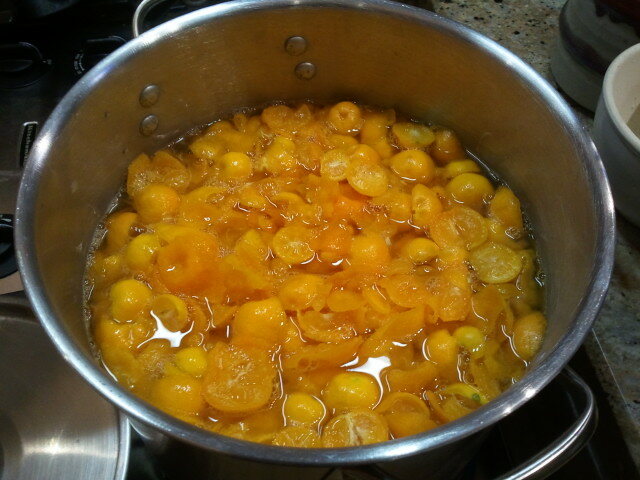 While you are boiling the marmalade place your cleaned glass jars and tops in another big pot. Make sure all items are covered by water. Bring the water to a boil and let it continue to boil for 20 minutes. When you fill your jars, you want to make sure the jam and the jars are still as hot as possible to keep everything clean and sanitized. The heat also helps to seal the tops to the jars...I love hearing the "pop" as the jars seal! Measuring the mixture helps you to estimate the number of jars you will need. Make sure to put a label on each jar that names the contents and the month and year you canned it...important for keeping track of your annual stash. There is an informative YouTube video that also shows a slightly different version of making marmalade that might be helpful to watch if you are new to canning. This recipe is as organic and low carbon foot print as you can get. 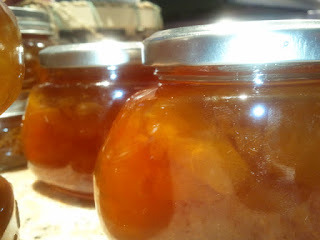 And by adding only 3/4 cup of sugar to each cup of orange melange, it is lower in sugar than most traditional marmalade recipes (next year I want to take it a step further and see what I can do successfully to further lessen the refined sugar in the recipe and still capture the same texture and taste). It is fresh and tart tasting. We love it! And it is a great gift for friends and family when you exchange gifts or go to a party. There is nothing better, or more meaningful than homemade. 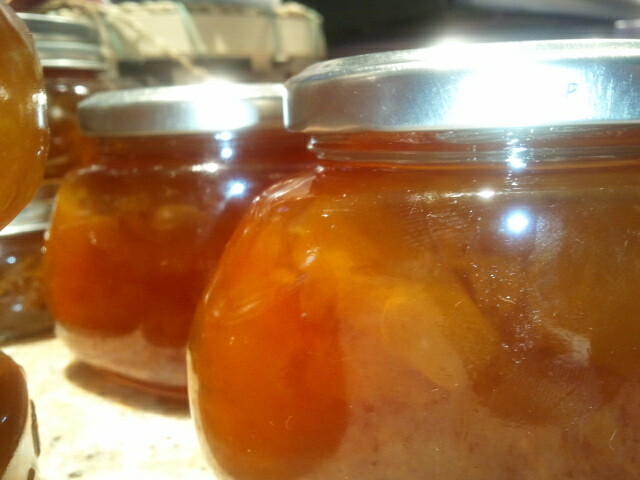 We love using our marmalade in a variety of ways. A spoonful in a serving of Greek yogurt is divine. Covering a round of brie and then heating it up in the microwave to then serve on crackers is a delicious appetizer for you and your guests. Adding a tablespoon to steamed carrots makes a yummy side dish for dinner. And then there are all the entree recipes that use marmalade...more on that in another blog. 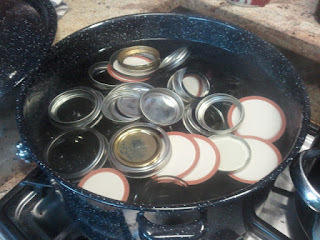 Hope this inspires others to get into canning. If so, let me know!